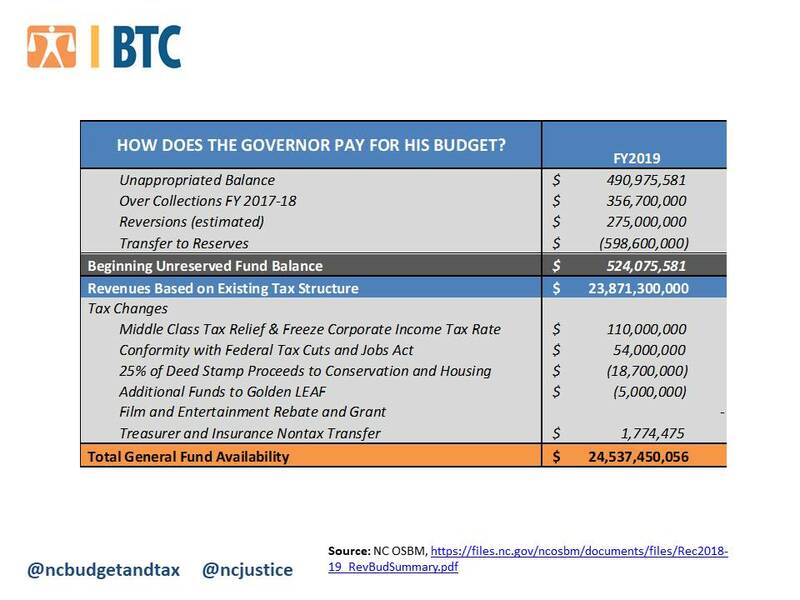 Governor Cooper released a proposed budget for 2018-19 that takes an important, though modest, first step in reversing the state’s failed tax cut experiment. The Governor proposed freezing corporate income tax rates at 3 percent rather than allowing them to drop again in January 2019, while also stopping personal income tax rate cuts on higher incomes. Combined, this fiscally responsible approach will ensure $110 million is available in 2018-19 for public investments in areas that have immediate needs. Over the full Fiscal Year, the result will be an estimated $223 million in revenue available. Even more work will be required to undo the years of cuts that have been the priority of North Carolina’s General Assembly. The hole we are in is deep. This prudent first step in this year’s budget process demonstrates, however, what is possible when leaders put public investments before tax cuts. The Governor’s budget invests in a number of priorities in communities across the state, including increasing the number of school nurses and psychologists, funding classrooms, ensuring the Department of Environmental Quality gets the funding it needs to monitor air and water quality, and funding the transition of young people to the juvenile justice system under the Raise the Age proposal, among others. There is no doubt that the damage of cutting tax cuts to our public institutions and communities has been years in the making and a more thorough adjustment from the tax-cutting approach will be required. That should not diminish the importance of Governor Cooper’s recognition that the first step when realizing you are in a hole is to stop digging. Let’s hope the General Assembly follows suit. 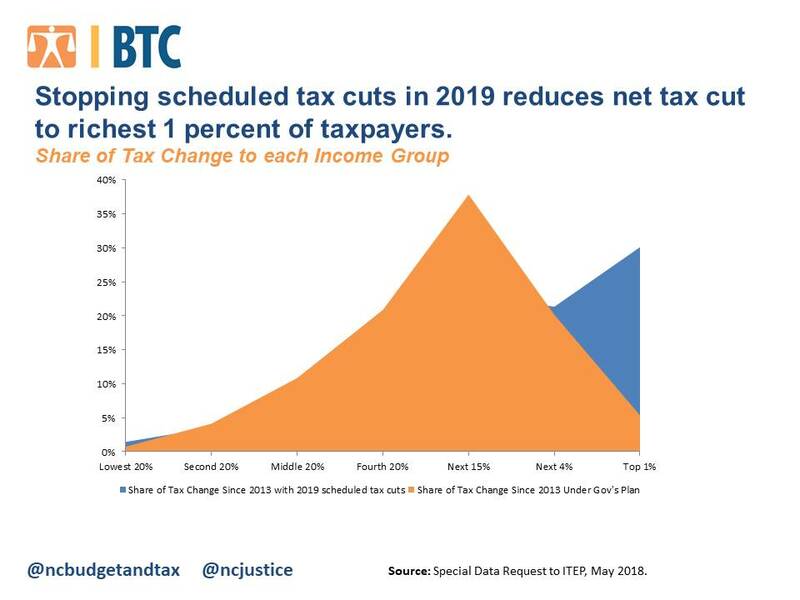 Holding off on another round of tax cuts for the richest taxpayers and profitable corporations and keeping the increased standard deduction and lower rate for the majority of taxpayers will reduce the tax cuts given to the top 5 percent of taxpayers since 2013. What does this mean for North Carolina in the long-term? The decision to stop scheduled tax cuts for the state’s richest taxpayers and profitable corporations will put North Carolina on sounder footing in the long-term. 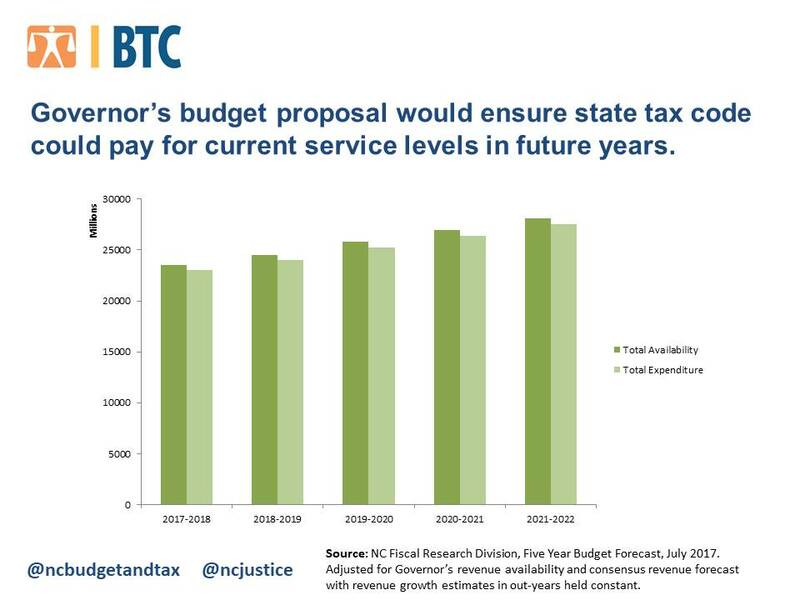 The General Assembly’s Fiscal Research Division has projected that revenues under the Senate and House plan to cut taxes again in 2019 will not allow North Carolina to meet current service levels for a growing population in future years. The Governor’s proposal for 2018-19, carried forward under current projected revenue growth and including the adjustment made in the Consensus Revenue Forecast, would allow the state tax code to maintain current service levels in future years. Alexandra Forter Sirota is Director of the Budget & Tax Center, a project of the North Carolina Justice Center.